Need a protective sun umbrella? We are proud to introduce you to the Silverback range of special UV protective umbrellas, designed by Rob McAlister Ltd and exclusive to Umbrella Heaven. The Silverback Autoretract sun umbrella features an enigmatic question mark handle is 86 cm (34″) from handle to tip and has a canopy span of 101 cm (40″). This unique and stylish sun umbrella is AUTO OPEN and AUTO CLOSE. This means they can be opened AND closed at the touch of a button. Press the button once to open, the shaft of this sun umbrella automatically extends and launches open the canopy. To close the umbrella, press the same button again and the canopy collapses. This feature, as well as impressing your friends and family, can also help people with limited use of their arms or hands. After the canopy has closed, with the rubber tip of the sun umbrella placed downwards against the ground simply push the handle downwards to retract the shaft of the umbrella until it clicks into a locked position. Your sun umbrella is now “reset” ready for the next time you need it. The Silverback Autoretract sun umbrella has an innovative tensioned cable technology combined with flexible fibreglass ribs and hexagonal section chrome shaft making it surprisingly strong in the wind. It’s official – The Silverback Autoretract has a UPF of 50+ Rated UPF50+ in accordance with the international standard EN 13758-1:2001. Ultraviolet Protection Factor (UPF) indicates how much of the sun’s UV radiation is absorbed. The Silverback sun umbrella canopy material was independently tested using a Labsphere Transmittance Analyzer. The results showed a rating of between 400 and 500 i.e. it allows less than 1/400th of the sun’s UV rays to pass through. This means the fabric will reduce your skin’s exposure to UV radiation significantly, because less than 0.25% of the UV rays will get through. 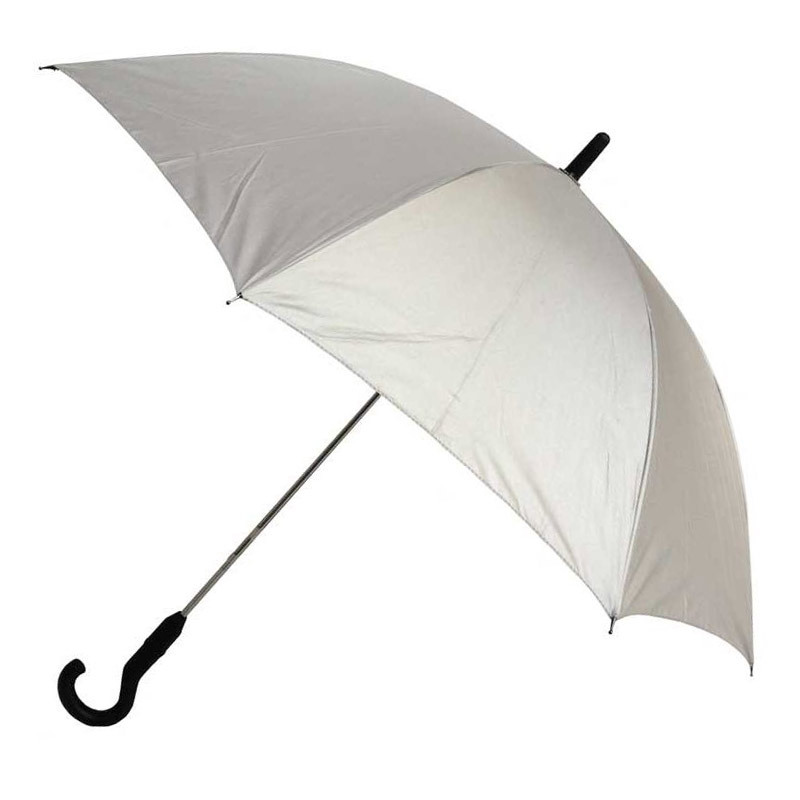 With this in mind we are confident this sun umbrella provides a minimum UPF of 50+. 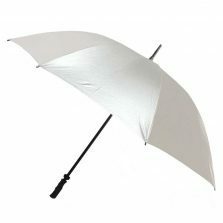 There are many umbrellas on the market with a silver UV protective inner canopy surface – indeed we sell them ourselves. The silver lining is intended to reduce the amount of Ultra Violet getting through the canopy. One slight drawback of this approach is that some UV can be reflected from the ground (depending on the surface) and then again from the reflective interior of the sun umbrella onto your head and face. Some people have argued that the parabolic shape of this sun umbrella can actually have the effect of concentrating the UV rays. To combat this we have reversed the conventional UV protective design so that the silver is on the outside and the black on the inside. The silver finish filters out much of the UV strength and reflects it away from the canopy. The black interior helps to stop the sun’s harmful rays from being focused on your head and face. Not the one for you? Check out the rest of our range of quality Sun Umbrellas! 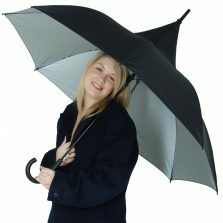 This is a beautiful auto-open and auto-close umbrella, perfect for walking support as well. 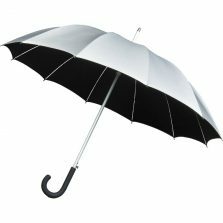 However every time the umbrella is used, it opens with a telescopic mechanism, and it needs to be pushed back to it’s original length to use again. As the push back mechanism is bit hard, it is not quite friendly for somebody with shoulder problems, and would need a harder surface inside car if driving. This feature is not described on the web site. Unfortunately though liking the umbrella otherwise I have to return it as I find it hard to use. 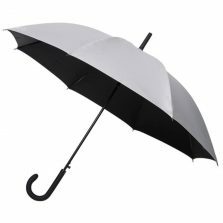 Such a well-manufactured umbrella – Sturdy but not too heavy, self-opening and most important in our rainy climate: self-closing, which makes it so easy to get into the car without getting wet. On sunny days the dark interior colour keeps me safe from reflected UV while the silver exterior makes sure I can safely venture out in the brightest weather. I also have the compact sun umbrella, so I thought I might not make a lot of use of this full-sized model, but I much prefer this one for everyday use, in both rain and sun, as its larger diameter provides greater coverage. It’s true, it needs a little push to open full and latch, but I have no dexterity challenges in that regard, so overall I just *love* this umbrella!